The CadMouse Pad Compact ensures maximum control and smooth,precise mouse movements. It is big enough for demanding projects but so compact that you can take it with you no matter where you are working. Smooth operator : The high-quality micro-textured coating of the CadMouse pad offers effortless precision for your engineering tasks. Accurate sensor tracking : Desktop surfaces are not optimized for mouse sensor performance. 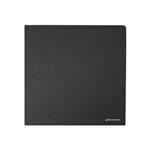 In addition to its tactile advantages,the lower friction surface of the CadMouse pad enhances its tracking qualities. This ensures accurate sensor imagery for an exact translation of your hand movements into cursor movements. Stability you can rely on : The surface enhances precision while the rigid middle layer ensures stability. The silicone base keeps your CadMouse pad in place so it won't slip while you are working.